Recently, the Reddcoin development team announced further developments regarding the POSV system, as well as a new wallet for Reddcoin. This new wallet integrates social networking, and IRC chat, directly into the wallet, giving users a reason to keep their wallet open for extended periods of time. This further differentiates Reddcoin from other digital currencies, such as Bitcoin, and even Dogecoin, which has been attempting to transition from a charity currency to a social currency with mixed success. 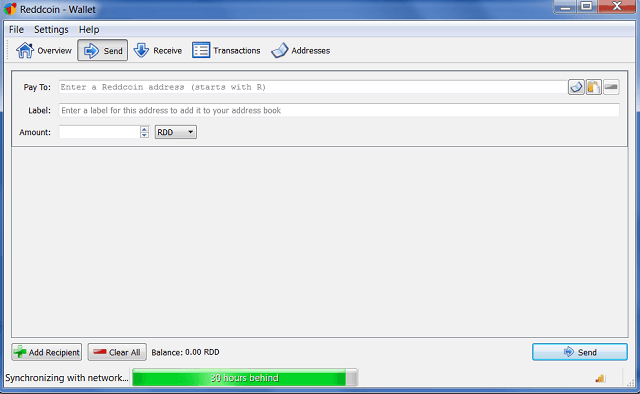 As an active member of the Reddcoin community, as well as someone who has often written articles about Reddcoin and it’s developement, I was given access to the beta version of this new wallet. I’ve now had a chance to use it for quite a while, and would like to share my opinion on what it does right, and what it is lacking. This tab shows the latest tweets from @Reddcoin, and thus gives users an easy way to see what is being said by the official Reddcoin team. Clicking on a tweet will open a user’s web browser directly to that tweet, thus giving the ability to read responses, retweet, or respond themselves. I’ve caught myself clicking on this quite often, and it has certainly increased the amount of @Reddcoin’s tweets that I read. The News tab has two options, one for Reddit, and one for Twitter. When Twitter is selected, the most recent Tweets that include #Reddcoin are shown. For a social currency, this helps to provide insight into what the community is talking about, and once again I applaud it. Overall, the Twitter integration is quite seamless, and accomplishes exactly what it seems like it would. The product is in beta, so I am sure these features will be more fleshed out as time goes on, but I am impressed by the development thus far. 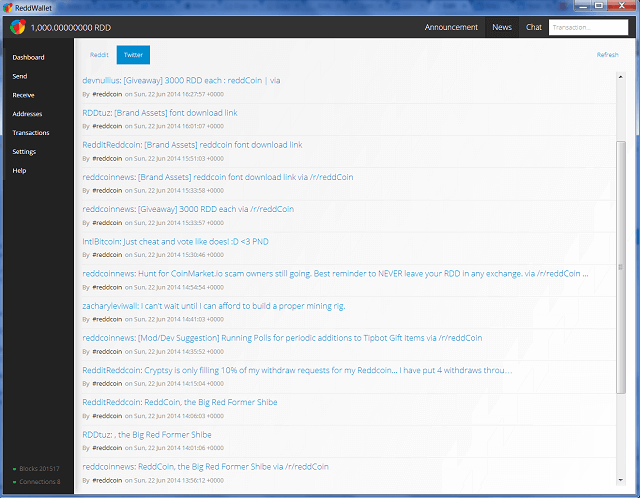 Much like with Twitter, the Reddit integration gives the user direct access to the Reddcoin subreddit. This access is found under the “News” tab, alongside the Twitter #Reddcoin news. This provides access to the most recent posts in the subreddit, and follows along with the theme of the Twitter “News” tab, as Reddcoin’s community is mostly concentrated on Reddit and Twitter. There isn’t much more to say about this subject, as I believe the screenshot below speaks for itself. 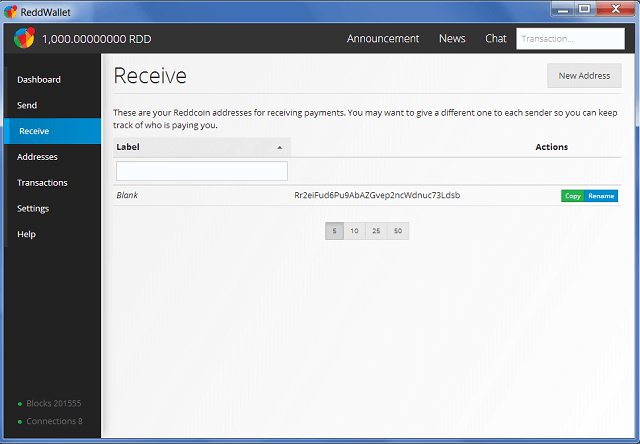 By far, the biggest draw, and most impressive feature in this wallet is it’s integration with the Freenode #Reddcoin IRC Chat channel. When the Chat tab is clicked, a screen appears requesting the user to input a chat nickname. However, if the user opts to skip that, it defaults to a randomly numbered “Reddlet” name. Once connect is clicked, the user is dropped into the Reddcoin IRC channel, and can chat freely. The Reddcoin channel is always full of people, but sometimes can be a little slow. However, I expect that will change quite a bit once this wallet leaves beta and becomes the standard wallet for Reddcoin. With so many users being presented with IRC chat, without the need to do anything beyond clicking two buttons inside of their wallet, IRC for Reddcoin is likely to be quite lively. 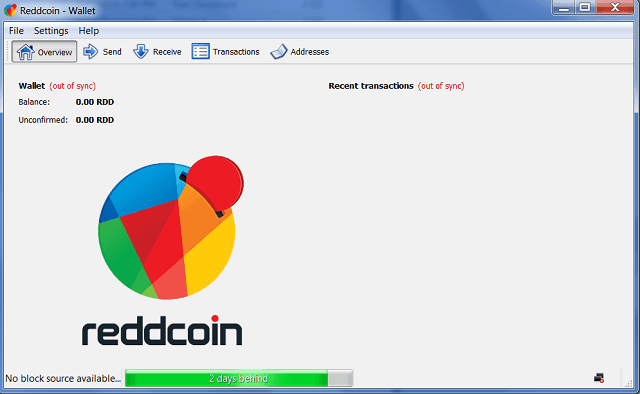 The old Reddcoin wallet functions perfectly fine, but looks almost exactly the same as the generic wallet for hundreds of other coins. The new design in the Reddcoin Social Wallet is sleek, and brings some personality to the Reddcoin Brand. To exemplify this, here are some of the updated screens compared with the classic wallet screens. Functionally, these updates do very little. However, they are very aesthetically pleasing, and could be developed to give additional functionality that is not present in standard model wallets. Rather than requiring a browser to open Twitter or Reddit posts, it should have the ability to open the pages inside of the wallet. Users should also be able to log in to their Twitter or Reddit accounts through the wallet. Facebook needs to be integrated. 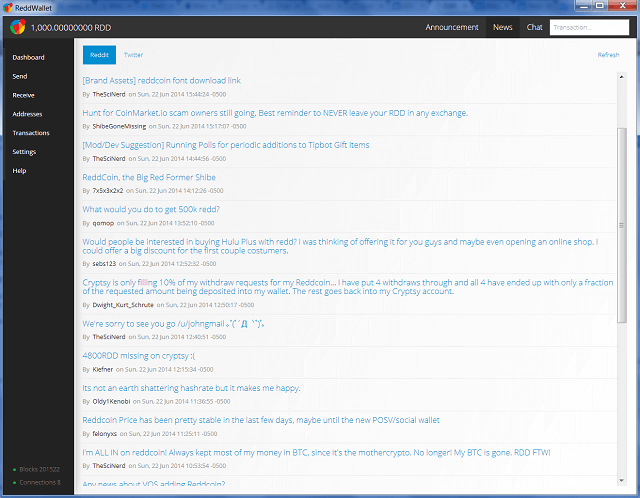 Rather than being confined to Reddcoin pages, give the users the ability to view other profiles, hashtags, subreddits, etc. I know that sounds counter intuitive to a team that is trying to build a brand, but once a user is using the wallet, they are already interested in Reddcoin. More freedom in this way would give users a real reason to use it as their social networking hub, rather than just for Reddcoin. Tipping needs to be implemented for all of these social networks, and on the IRC channel. On the IRC chat channel, it would be understandable if tipping was limited to users using the social wallet, as that would give a way to tie a user to a wallet, without the need for a middleman tipbot. Of course, even without these additions, the new Reddcoin Social Wallet is leagues ahead of the competition. I’m very impressed with it, and it will work brilliantly with the switch to POSV. While I may have features that I would like to see added, they would just be icing on the cake. Once again, to Laudney, Hoppipoppipolla (the creator of the wallet), and the rest of the Reddcoin team, I applaud you. Great work. Keep moving forward, and stay a few steps ahead of the competition. If you can manage that, then I expect to see Redd around for quite some time. Awesome–you follow us on twitter as well? If so, send me @Coinbrief your handle & I will send you a little welcome gift.